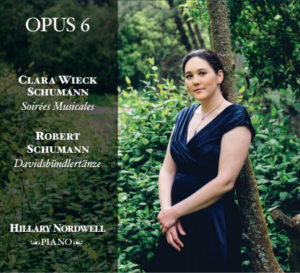 Tumultuous and beautiful, the love story between Clara and Robert Schumann captured my imagination the first time I encountered it, and even more so after I’d read the volumes of letters Robert and Clara sent to each other leading up to their marriage. The fact that one can read almost every word of communication that passed between the two during the time leading up to their marriage is astounding, and incredibly Romantic, in every sense of the word. Somewhere along the way, I realized it was their music, in addition to the written word, that enabled them to share such a fulfilling “long-distance” relationship, despite the fact that Clara’s father made it nearly impossible for them to spend any time together. Out of that realization comes this album, a pairing of their Opus 6 works, both composed in the years before their marriage; in a way, its own musical love story. Preview tracks and digital album available at CD Baby and iTunes, and Amazon. 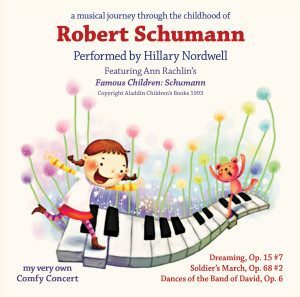 Robert Schumann: A Musical Journey offers a wonderful opportunity to introduce the child in your life to Schumann’s piano music and early life! Structured in the familiar Comfy Concert format, this brand new audio CD contains a thoughtful combination of story and music, meant to engage and inspire young music lovers. Colorful examples of Schumann’s piano music, including the 18 short character pieces of the Davidsbündlertänze, Op. 6, musically “illustrate” Ann Rachlin’s entertaining and educational story about his childhood. Other works featured include Träumerei from Kinderszenen, Op. 15 and Soldier’s March from Album for the Young, Op. 68.